I’m a huge fan of all sorts of different fish recipes. I will also admit that I do not eat as much fish as I would want to. I do make a Wisconsin fish fry on a fairly regular basis and have been known to smoke plenty of fresh trout, but I want more fish! With that said, I had just came off one of my shrimp scampi recipes and immediately fell in love with the wine sauce. So I thought, why not try a different type of fish other than cod or trout, and jazz it up a bit from herbs from my garden and make another wine sauce. Boy, I was I ever right. I decided to go with a swordfish, not only because it is super awesome for you, but it could stand up to some pan searing. This recipe will be sure to please and offers a new take on a new type of fish for the family. Start by seasoning your swordfish with salt, pepper, rosemary and thyme. Push it gently into the fish. Heat your large skillet on medium to high heat. Add in the oil and get it nice and hot, until it shimmers. Carefully add in the swordfish and sear for about 7 minutes, or so, on each side. Your internal temperature of the thickest part of the fish should be around 135-140 degrees. Plate the fish, then pour the sauce around the perimeter of the fish. Garnish with a lemon, and sprinkle a bit more of fresh rosemary, thyme, or cut up chives. 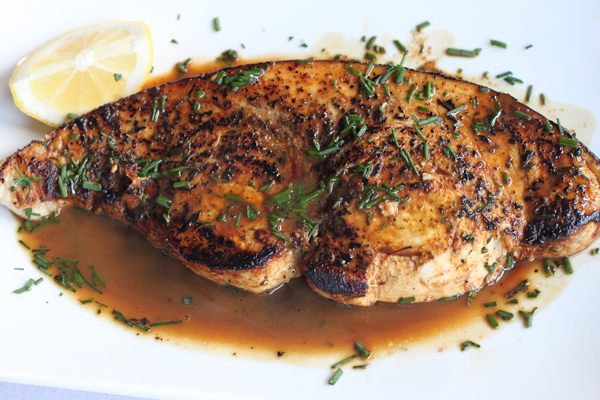 The result is a truly great piece of fish that had this dark brown wine sauce that went perfect with the lemon, rosemary, and thyme. If you are looking for a new fish recipe, give this one a shot. A simple fish dish that is huge in flavor. what other fish could I use instead of swordfish. Sounds great, Charlotte. Glad everything came out with a twist! This was the most delicious fish!!!! I adapted it slightly for my blog High Heels to Hot Wheels by using garlic and rosemary infused olive oil, but your recipe is FANTASTIC!! I prepared this recipe using frozen swordfish steaks from Trader Joe’s – and it was hands down the most delicious swordfish we have ever eaten! My husband thinks we could open a restaurant and serve this dish. The only change I made was that I cut the searing time to 3 minutes per side, which was the recommendation on the preparation instructions from Trader Joe’s. It was perfect! Thank you! Thanks Ayoka! I hope it turns out well with your date… Enjoy! This recipe was great! I adapted it so my husband could grill our fish, but the lemon butter sauce was wonderful. 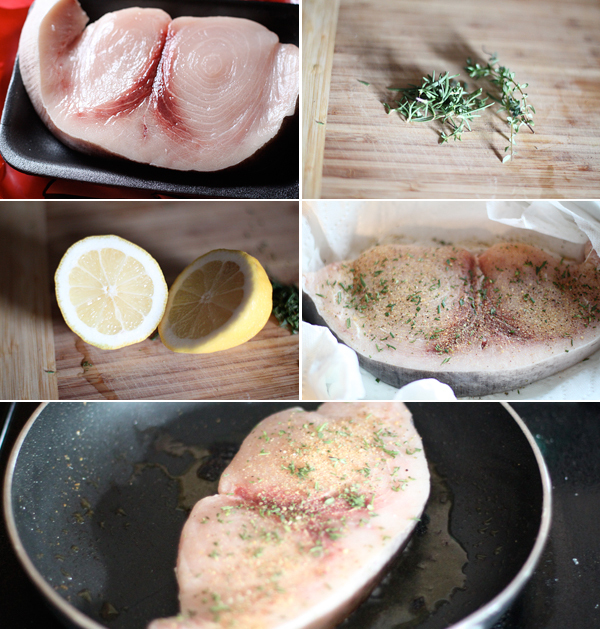 This will probably be the only swordfish recipe I use from now on! This is an excellent recipe! I made it exactly following the recipe, with only exception being I seared each side for 4 minutes. It gives you a restaurant quality dish yet so easy to make. Thank you for sharing! This was delicious! I was browsing the web trying to figure out what to do with two swordfish steaks I bought, and this recipe turned out amazing. Easy, simple ingredients I had on hand, and power-packed flavor. Thank you!! Awesome! Thanks Sarah, and glad you enjoyed the recipe. Thanks for the recipe. Only thing I would change is cook the fish more like 4-5 minutes per side before adding butter, wine, etc. To keep fish from overlooking we removed it while the sauce reduced. Delicious and juicy! It was awesome! We paired it with fresh sautéed whole rainbow organic carrots. We ate everything! Thanks! And…..we printed out the recipe for another time it was so good! The cook times need to be revised. 14 min then add ingredients and reduces as per directions will result in over cooked. Ingredients should be added early into the second side cooking so you can finish and pull at 135 to 140 degrees. Cooked properly this is an amazing dish. Tried this last night and it was great. Loved the sauce, we had broccoli that went well with it to. I would make this again. I did the fish 4 min on each side. Then 2 min once sauce was added. Being out of white wine (gasp, how did that happen? ), I also used vermouth and an extra tablespoon of butter at the end. I usually leave the cooking of fish to my husband, because he grills it amazingly. Today, however, was windy and cold outside, so I decided to try another way and I’m so glad we did. We will definitely make this again. That’s awesome! Glad you enjoyed (with or without wine) the fish! Super tasty! Like some others, I reduced the searing time – 4 minutes on one side, then 3 minutes on the other, then adding the butter/wine/etc. and reducing for about 2 minutes more or so before pulling the fish. Definitely going to try again with trout next time!